There are multiple reasons why you might be wondering, “How do I sell my house fast?” While sometimes selling a home for cash is a last resort, other people find it to be easier than going through a realtor or agency that collects outlandish fees and closing costs. 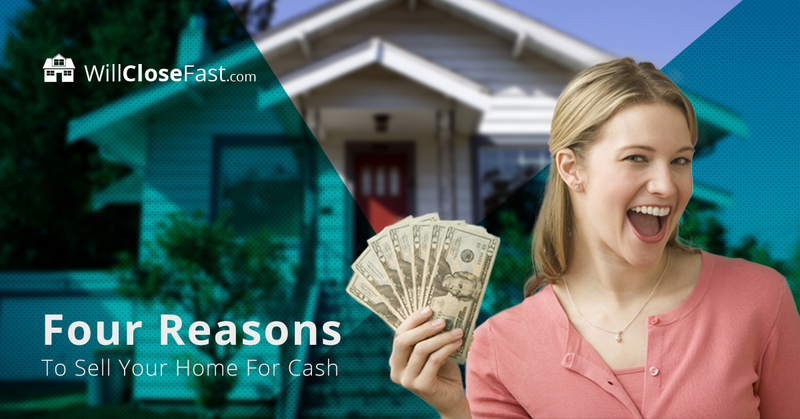 There is no right or wrong reason to sell your house for cash, but there are some reasons that are more common than others. Today we’d like to talk about four of the most common reasons that people sell their homes for cash, and how Will Close Fast can take the burden of selling property off of your plate. Homes built before 1978 typically have lead-based paint, and some even have lead paint that is hiding under layers of new paint. Even with a new coat of paint, the dangers of lead poisoning is still a present hazard. If you know about lead paint in your home and are trying to sell, you are legally obligated to disclose that information to potential home buyers. The average lead paint removal costs around $10,000, but can cost upwards of $30,000 for larger houses. Lead paint should be taken care of as soon as it is detected, especially if you have young children or elderly parents living in the home. If you cannot afford to remove the lead paint and you are not attached to the home, it may be easier to sell your house for cash to a home investor like Will Close Fast. Most home buyers won’t even consider purchasing a home if it has lead paint because they will eventually have to pay to remove it. Will Close Fast can buy your home as-is with a fair cash offer, even if there is lead paint. When a loved one passes away, they often leave their home to their next of kin. The fact is that these inherited homes come in all states. Some homes have been kept up and are in great condition, but others are deteriorating and falling apart at the seams. At the end of the day, the home can become more of a burden than a gift. If you’ve inherited a home that you simply do not want, can’t afford, or can’t manage to rent out, Will Close Fast can offer you cash for your home. We are sensitive of your situation and understand that this can be a difficult time. We are judgment-free home buyers committed to getting unwanted property off of your hands, no matter your reason for getting rid of it. Owing more on your home than it’s worth is one of the worst feelings in the world. During this time, you have a couple options. You can stay in your home and hope that the market will turn around, but sometimes mortgage payments are too much to handle. Missing payments on your home can damage your credit, and foreclosure can lower your credit score over 100 points, which can take almost a decade to fix. Filing for bankruptcy or foreclosure should always be the last option, and making late payments is a sign that you should refinance or get rid of your home before it damages your credit score even more. At Will Close Fast, we will make a cash offer on your home, even if you owe more than it’s worth. We want to help you sell your home quickly so you can avoid another late payment or stop foreclosure. During a divorce, asset division is usually based on mutual agreement, court-ordered, or in accordance with a prenuptial agreement. So what happens when a home is by far the most valuable asset that a couple owns together? There are a few roads a couple can take after an agreement is reached. One partner can buy out the other partner to keep the home, or the couple can decide to sell the home and divide the assets. Divorce is already an expensive situation with lawyer fees and finding new living arrangements if needed while the divorce is being finalized, as well as continuing to pay a home mortgage. Selling your home through a realtor is also expensive due to realtor fees and closing costs. At Will Close Fast, you and any other homeowner can sell your home for cash fast and easily, with no additional fees. We are committed to excellent customer service, and that includes helping our customers ease the pressure of divorce by working quickly to avoid any further negotiations and getting your largest asset divided. If you are trying to sell your home in Missouri, Will Close Fast wants to help. Our dedicated and experienced home buyers team can visit your home, make a cash offer, and you’ll be on your way before you know it. If you are wondering, “How much is my house worth,” before you consider selling for cash, check out our home value estimator to get started. Contact us today to learn more about selling your house for cash!